I like my Shadow too! IMO, it has a trigger as good as any of my custom 1911s. Overall it is the most fun gun I am currently shooting with my P01 a close second. I just shot my Shadow 2 for the first time today and all I can say is WOW!!! Did you change your safety out to the larger one? Ugh, the next ~6 weeks arent going to be easy. Im waiting on mine to go through Cajun. I changed mine to the larger safety. Mine also went through Cajun it is one of the nicest actions I have ever felt on a pistol. Hiya Darrellnv and welcome and thanks for your thread. We fans of cz are happy to hear you enjoy the Shadow2. But its ok to also be a sig fan. 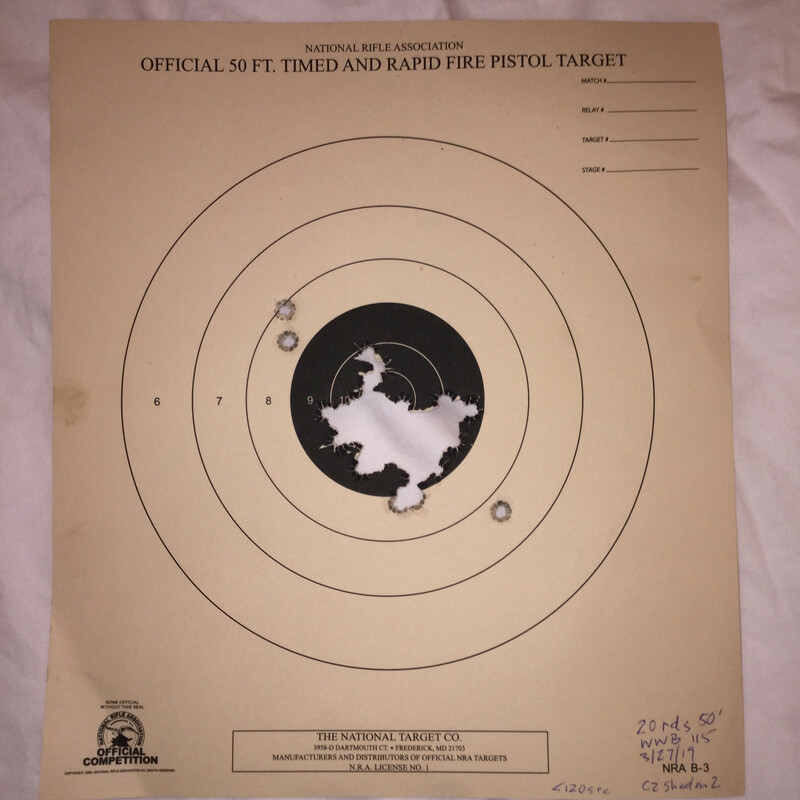 My 50yr old p210 shoots as good as any tactical sports,checkmate,or long slide I've owned. And the slides action on the rails smooth as glass. Hope you share a day at the range report as you break it in. Be well. Just got a Shadow 2 last week. Brought it to the range with a couple of boxes of WWB 115's and ran an NRA B-3 out to 50 feet. Here's the first target and I could not believe it. I'm not that good. It's not me. The thing shoots itself. It's my new favorite and I have some very nice customs and semi customs. I think it's the best bargain in firearms I've ever found. I own the seven and two eights, not CZ or Winchester. Hiya and thx to the operators day at the range pics here, very nice. And czecherated I promise you at 50ft that pattern, unless shot out of a rest, is not just the gun. And you should look into training for some competitive venues,as you may just be a natural. Be well. Thanks. No rest, but I cheated by using two hands. Maybe had a good night. I'm just a club bullseye shooter. We have informal club matches on winter saturdays at 25 yards. I don't have an NRA ranking in pistol. I do OK, 90 +/- four points. 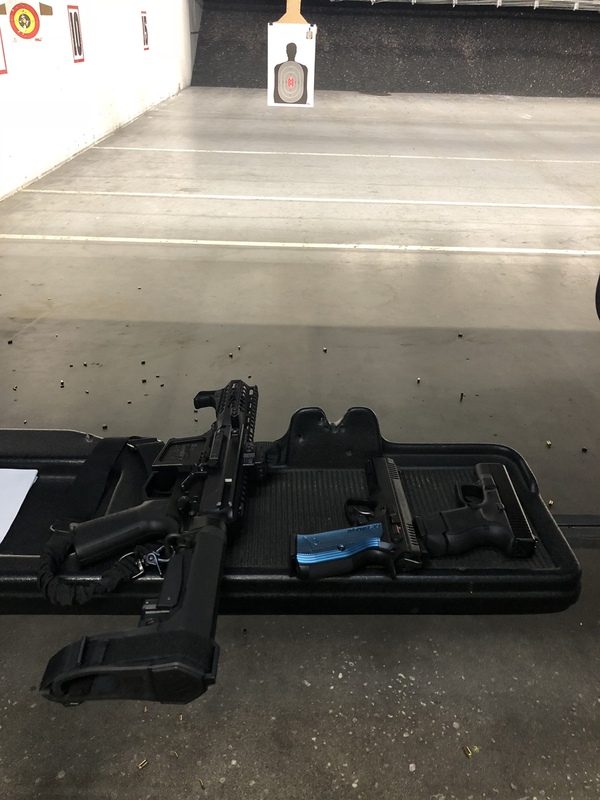 I mostly do NRA/CMP High Power (rifle, haven't been able to make master yet) with a space gun and when I have time, I go to the indoor pistol range after matches or I sneak off at night. Rifle competitors say pistol messes up one's off hand scores - causes pulling down slightly when breaking the shot. Anyway, I'm not really good at either one, not like other people are. My point is it's all the CZ. There is something just right about the Shadow. There's something about the ergonomics. That was the best target, but the others were all pretty much the same. (Think I need to come up a click or two.) Previously, the only thing I could shoot well is a 1911, but I have a full custom 1911 in 9mm and I shoot this better first day out of the box. This really helps me get it right. The weight helps keep the muzzle steady before I can screw up the shot and so do those full length rails. This is a terrific design. Don't know anything about move and shoot. I guess I would have fun shooting USPSA/IDPA, but I might get DQ'ed all the time - so many rules to remember. I'll have to ask some friends to take me to matches. You should try USPSA. The rules aren’t that hard to remember. Yeah IDPA has too many rules to let the shooter focus on the important stuff, shooting the stage the fastest and cleanest. One of my biggest gripes is that the more rules you have the more the competitor tries to find away around them to shave time, also more arguing afterwards.